South Korean Foreign Minister Kang Kyung-wha will attend the funeral of former President George H.W. Bush this week, her ministry announced Tuesday. Kang is leading South Korea's delegation to the funeral to be held at the Washington National Cathedral in the US capital Wednesday. The delegation will also include Seoul's Ambassador to the US Cho Yoon-je and Ryu Jin, chairman & CEO of Poongsan Group, a South Korean conglomerate, according to Noh Kyu-duk, spokesman for the Ministry of Foreign Affairs. 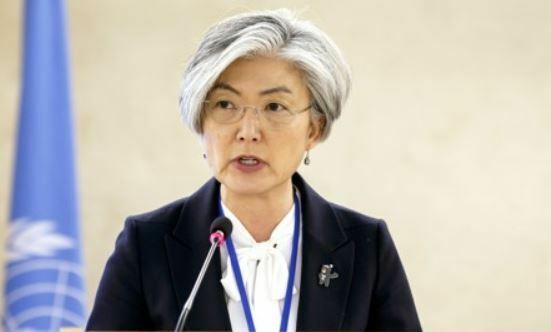 On the possibility of Kang's meetings with US officials during her Washington visit, Noh said at a press briefing that there will likely be some opportunities as US dignitaries plan to attend the funeral. An informed source said that the minister is pushing for talks with Secretary of State Mike Pompeo, who is also expected to be present at the funeral.